Like (too) many days this spring, Saturday was forecast to bring occasional rain but instead showered us with lots of sunshine. I sleep like the dead, so I cannot attest to the severity of our weather overnight, but my friend Amy who lives nearby said that it rained mightily in the wee hours. So the plants did get a good watering, at least. The main project for today was to stain the posts for the grape arbor, and hopefully get them all secured up in their Groundmaster sleeves. 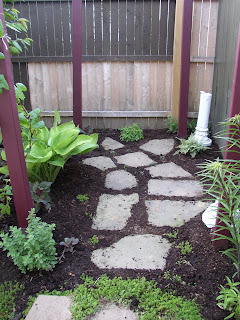 I also wanted to set the last of the stones in the little patio beneath the arbor. 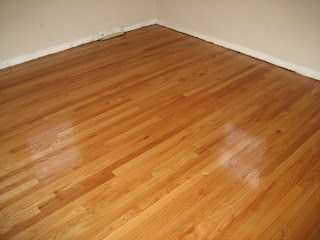 When I finally settled in to work, the staining went pretty quickly. 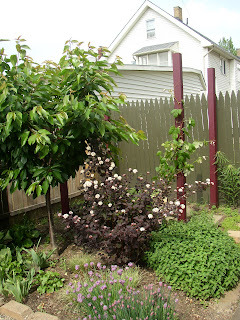 I knew that I would be two posts short of what I needed for all of my trellising projects, and discovered quickly that the tall ones for the grape arbor are the missing posts. 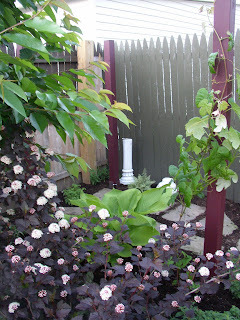 For now, I put two short posts up but did not secure them, both to see how the stain would look on a full arbor and also to more easily stain the shorter posts that do not yet have an anchoring system set up. 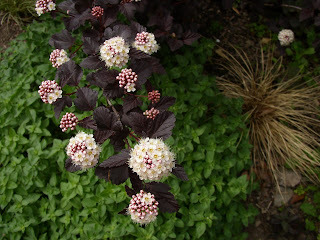 The beautiful shrub center stage above is 'Diablo' purple ninebark, physocarpus opulifolius. 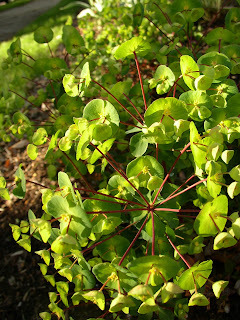 Earlier this spring, I was lamenting that I already had 'Diablo' because I was so taken with the spring color of 'Coppertina,' but right now I feel completely satisfied with my choice. 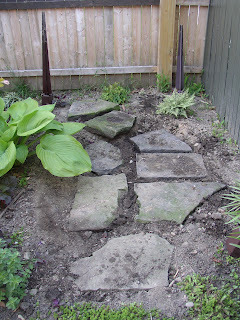 The rest of the stones were dug into the ground for the patio, and I replanted the two freebie ferns ('Ghost' and 'Wildwood Twist,' I think) that lived through the winter. 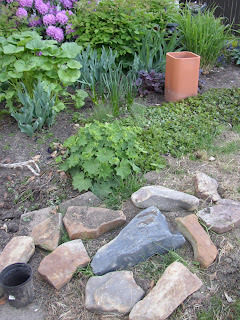 I cut up two little pint-sized pots of leptinella and tucked 9 chunks of varying size in between the stones at the shadier back end of the arbor patio. 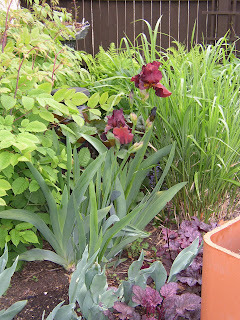 Did you notice the wide berth that I left for the hosta? This is a NOID hosta that I snagged from work, but if it isn't 'Sum & Substance' then it's a kissing cousin. It won't get enough sun to be bright gold here, but its big leaves will still be a nice chartreuse and provide a light background for the ninebark. So far, I'm really thrilled with the way this corner is shaping up. My one concern in looking at these pictures is that... well... it might just be a little too pretty for me! 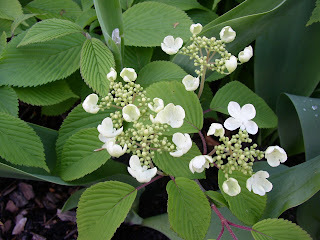 But the pinky flowers of the chives and the ninebark will be done soon, and the gorgeous white blackberry flowers will (I hope) turn into juicy goodness. Or, maybe by the time the arbor is completed and I have hung a few funky lanterns from it, that will be all I need to make me happy. We'll see. 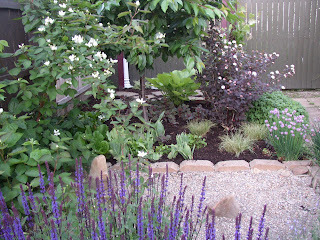 By the way, my apologies to those of you who were expecting to see a French-inspired garden because of the post title. It struck me as I was staining that 'Bordeaux,' which is the name of that particular stain color, was a great choice for a grape arbor. And it cracked me up to think of my little corner of grapes, grasses, humble herbs and funky shade plants having such a grand-sounding name... so the 'Bordeaux' garden it is! Looking through my plant tags this evening, I realized that some of my plants seem to go together very well. Almost too well... as if the specific cultivars were chosen because their names went with a theme of sorts. Interestingly, I had very little (okay, nothing) in the way of plants with sugary, warm-and-fuzzy names, 'Sweet Kate' spiderwort aside. So that makes me wonder... what's in a name? 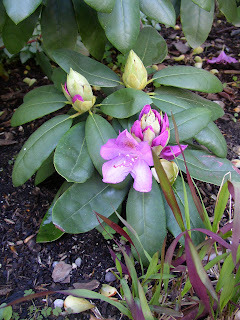 Do the plants I tend to like lend themselves to certain types of names? Most of the time, it's just about the plants when I make purchases. I have a few unfortunately named plants in my yard. And I would have purchased regular allium karataviense instead of these 'Ivory Queens'... but does a cultivar name subconsciously influence my buying decisions? Hmm. While I ponder this, I would be interested in knowing whether any other gardeners have noticed a theme running through their gardens, unplanned. These name themes certainly snuck up on me--it's not like I was planning a theme garden, that's for sure. I'm simply not that organized! Anyone else? Today, for the first time since a short, warm week in April, I felt summer! It streamed through my window in the morning and pulled me outdoors, with no thought for any pedestrian pursuits like eating breakfast or brushing teeth. It even made me forget, for almost an entire minute, that I'm definitely not a morning person! Only when my bare toes had felt the sun-warmed concrete of the driveway, and my tender veggies had made it safely back out into the sunshine after spending the chilly evening inside, did I realize how hungry I was. And since I had Big Plans for the day, I knew I would need a good breakfast. 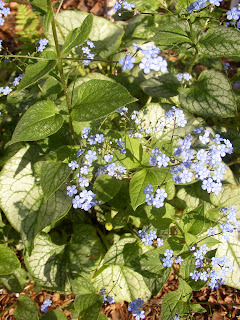 But first, I wandered outside, coffee cup in hand, checking out the garden. 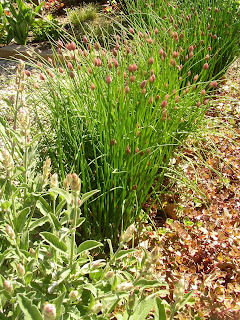 I know that I have showed this simple combination of chives, sage (salvia officinalis 'Newe Ya'ar) and 'Fuldaglut' sedum before, but it continues to thrill me. 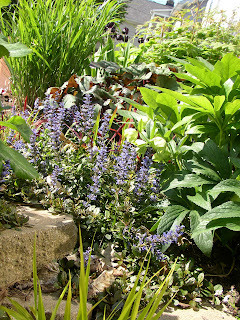 The 'Diablo' purple ninebark behind, and the stand of 'Caradonna' salvia to the left (both outside of this frame) really help define the space, but this plant combination alone makes me happy. 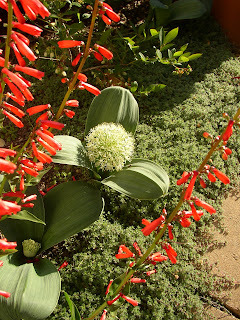 Spikey, soft, upright, whorls of color... it's all there. And that they are all "humble" plants, two of them "mere" cooking herbs, makes it even more fun somehow. It occurred to me as I walked around that I might have actually planted my shade garden too tightly. I meant to plant things closely, as my mind rationalized that with dry soil and the gardener's reluctance to water anything not edible, this trick would give the impression of a lush garden anyway. 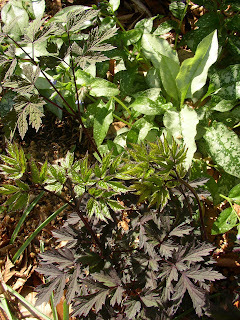 But I might have taken that a bit too far, as you can see here with the 'Hillside Black Beauty' bugbane and its underplanting of pulmonaria. I thought that the bugbane would look tall and leggy, and the pulmonaria would provide a low, silvery foil, but right now it just looks crammed together. 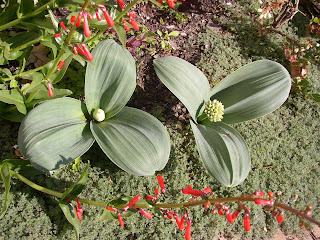 I'll have to keep an eye on this as the bugbane grows to see if it matches the picture in my mind's eye or needs to be moved. On the brighter side of the shade garden, 'Othello' ligularia is doing its dark, brooding thing next to an unusually lively hakonechloa macra 'Aureola.' 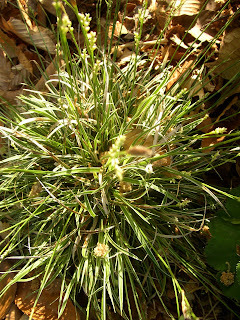 The Japanese forest grass sports these lovely red tips each fall, but I haven't noticed them in the spring before. I'm guessing that our continued cool spell is playing a role in my garden all around. The hakone grass is tipped in red, my zebra grass is already almost 2ft tall and has yet to show much banding... but on the other hand my neglected moisture-lovers, like the ligularia, aren't yet looking as lackluster as they tend to do when it gets warm. Eventually, I did take advantage of the gorgeous day to get some heavy work done, and as you can probably guess from this post title, my work involved pathways, "locks" & stones. But concision is not one of my strong points, and I'm never able to edit myself well when I'm as excited as I am about today's sunshine and this current project. 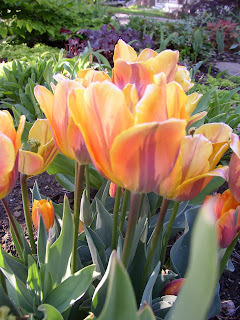 This is already a long post... and I have to get to the grocery store before it closes, or I will have nothing to eat for lunch at the garden center tomorrow... so the rest of today will have to be explained in a "part two" posting. I hope that all of the rest of my fellow garden bloggers were able to take advantage of today's wonderful weather as well, whether working or playing. It really was a nice one--here on the sunny shores of Lake Erie, at least! May has been an interesting month. 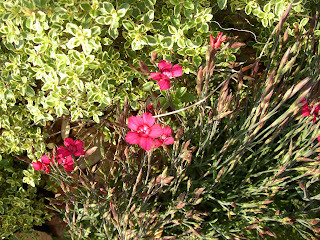 Some of the early bloomers got all mixed up on when they were supposed to bloom, I discovered that serendipity had created a color theme in my spring backyard garden, and I got inspired by my brother and sister-in-law's ambitious first garden. All the while, things have been blooming. Many things. 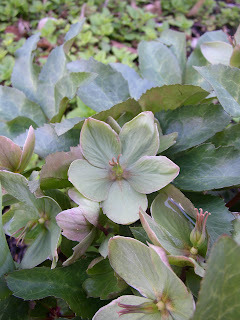 But before I show you some of them and list others (in the spirit of May Garden Bloggers' Bloom Day, hosted by Carol of May Dreams Gardens) I want to point out the beautiful state of decay of my Ivory Prince hellebore. 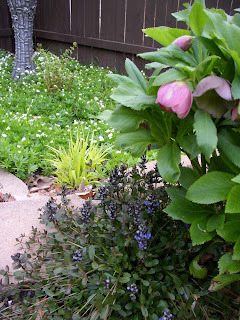 Having such a small urban garden, I really value plants that look good when they are supposedly "past their prime!" 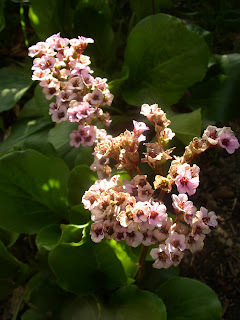 "The Bad Bergenia" has bloomed profusely this spring... as if to mock me for thinking about taking it out and replacing it with something prettier. And the foliage has looked nice, too. I still mostly scowl at it--what a cheeky plant it's turned out to be! 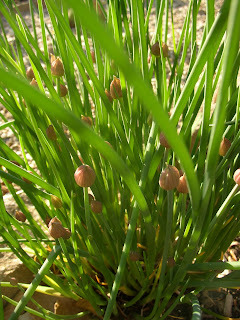 I just love chives... both edibly and aesthetically. 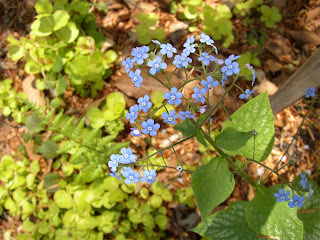 Spring is a time for new beginnings... and a lot of work in the garden! I have been staining fence panels as they are needed for espalier and trellising, and also double-digging some new beds. I'm down to maybe 5 minutes total for mowing both the front and the back yard. My John Deere-loving father will be very disappointed with this turn of events... but he'll be happy to know that the amount of grass you see in this picture will basically remain. It will just be a more environmentally friendly grass, eventually. Why keep some lawn? 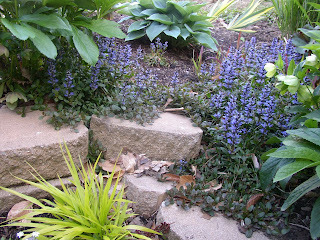 Aesthetically, I like the fact that it serves as a ground for the other plantings and gives the eye a place to rest. Practically, it gives both the Gardener and the Garden Assistant a comfy place to rest our bodies as well. 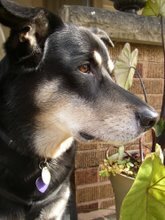 In fact, we both snoozed for a while on the lawn this weekend... you know, just in case the neighbors were starting to wonder if I'd suddenly gone sane. Can't have them thinking that! You might notice that I also moved the second square drainage tile (both were trashpicked from a treelawn in '05) into the same bed as the first. It is set a bit higher than the tile closest to the driveway, which will hopefully lead your eye to the cherry tree that will soon be planted and espaliered against the fence. 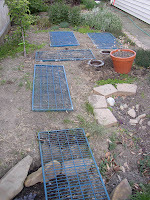 The tile will add some much-needed structure, along with the arc of lavender cotton that I'm planning, to this very wide bed. (Sometime soon I'll take a picture from my second-story bedroom window so you can see what I mean.) 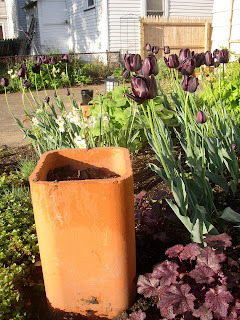 I'm not quite sure what I'll be planting in these tiles for the summer just yet, however. I'll have to take a walk through the annual section and see what strikes my fancy. - I am playing A-league women's sand 2's for the first time ever, and we won our first game last night. This is an athletic challenge that I am unlikely to experience again in my life since I'm already at the ripe old age of 32... and even though we're no Misty May and Kerri Walsh, we're having a heck of a lot of fun. I can't even tell you how much this is invigorating (and exhausting) me. 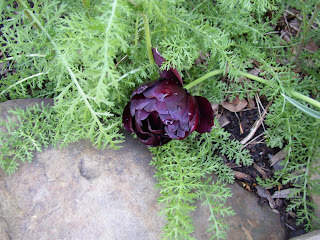 - I love to watch new foliage unfurling in the garden. 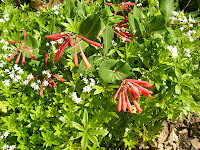 Particularly baptisia. 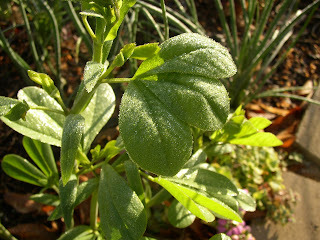 Particularly when the baptisia is backlit and covered in morning dew. - Most of my time working at the garden center is spent dispensing advice and answering questions, but sometimes I am on the receiving end of ideas as well. Last week, a lady turned me on to this recipe for Grilled Chicken Sandwiches with Sage Pesto and Apples from an old issue of Bon Appetit. She said that the sage pesto is so good that her family eats it throughout the summer and she rarely makes pesto with basil anymore at all. I doubt that I would go quite that far, but I definitely want to try the sage substitution. And it might be good with walnuts instead of pine nuts, too. Yum. 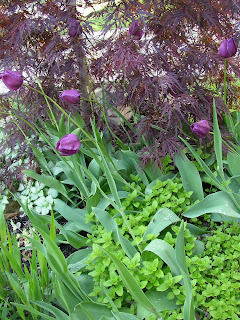 So many fresh ideas, unfinished projects, and new growth going on... yes, it's finally spring! Notice that the fence has been stained recently? The grays unfortunately skipped from medium gray to black, so I had to settle for "Coffee" instead of dark gray as a fence color. The trellis I'm putting up is to help encourage my native honeysuckle to climb the fence. 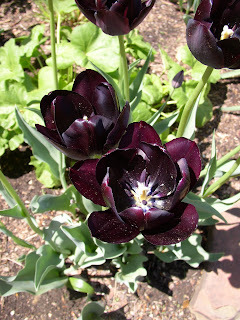 I had given up on these species tulips, tulipa tarda, which you see both above and below, because they are supposed to be early tulips and they hadn't even shown up by the time the greigii tulips all bloomed. They were a nice surprise this weekend! 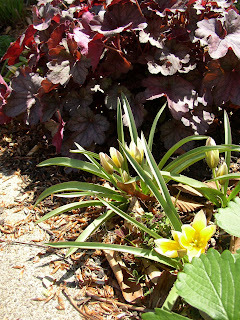 I planted them next to the purple foliage of 'Regina' heuchera, which amazingly enough is in its second year in the same spot, knowing that their yellow and white petals should show up well against the colorful coralbells. 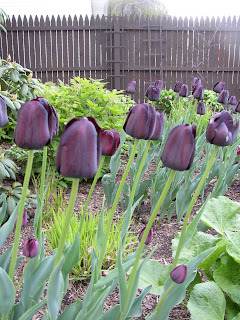 I guess it just goes to prove that some spring bulbs are indeed "late" in the first year after planting. 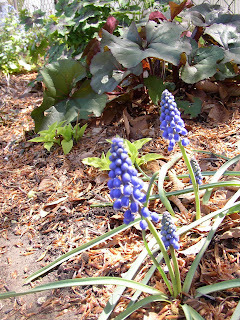 Grape hyacinths are tucked in all along the driveway bed as well. 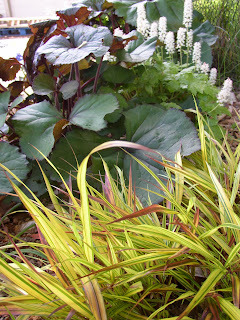 Their color mixes nicely with the leaves of 'Othello' ligularia and a miniature hosta. 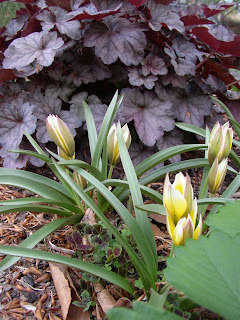 When I bought the hosta at a Master Gardener sale, 'Dawn' was the name on the tag, but I'm not sure that is correct. It's pretty, either way. I know that some of you might be wringing your hands at the thought of the sweet woodruff. 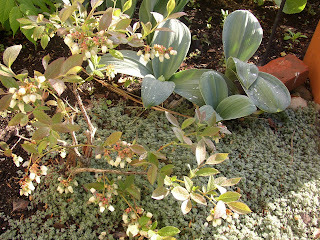 But I absolutely love the scent so I deal with this high-maintenance groundcover. 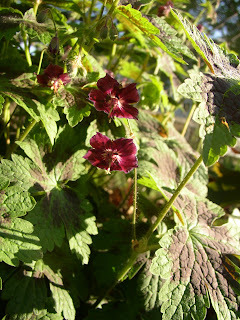 It gets pulled out from around the brick retaining wall as soon as it's done blooming, and thus stays out of the flowerbeds. Three scaly Buckler ferns have no problem growing up through the woodruff, and my broken-but-still-beautiful bird bath adds some height to the corner. All in all, I'm pretty pleased with how these parts of the backyard are shaping up--and that they seem to have a spring color theme is definitely an added bonus! But there are plenty of areas of the backyard that I am not about to show off just yet... much construction will commence now that I'm recovered from both the flu and the sinus infection that it left behind as a parting gift. As I noted a few years back, my younger brothers were not gardening prodigies. But they have both come a long way since then. Both of "the boys"--and the wonderful women they lucked into marrying--have been growing small edible gardens at their rental housing for the past few years, much to my delight. 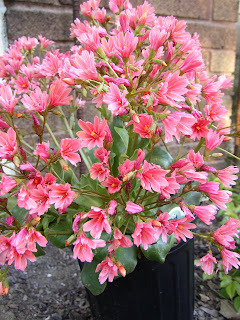 There has obviously been some branching out into the ornamental as well, as you can see in this succulent pot above. Also obvious here is that my brother, unlike me, has not inherited my mother's black thumb when it comes to growing aloe. Damn unfair genetics. While other family members were asking about the number of bedrooms and bathrooms, I was scoping out pictures of the yard, wondering where and whether they might tuck in a garden or two. Maybe a week or more ago, I got a phone call from the kids. They were all excited for me to check out pictures of the new veggie garden they had started in the backyard, and I was of course excited to hear that they had started one! The first picture shows the work from day 1. The garden is located at the back corner of their property, a good 8 feet or so in from the property line. See all of the string? I'm sure there was a level involved, too... my brother's an engineer. And we all inherited our parents' common sense and general "If you're going to do it, you might as well do it right," attitude. The bed is pretty ambitious in size, and big enough to hold lots of veggies. I knew that they were planning to build up the wall a bit more, but I was surprised when I saw this next picture a few days later. 5 rows of retaining wall block! 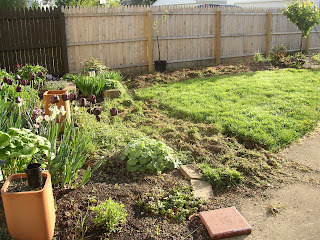 This side of the yard sloped more than I'd thought. I wonder if this project just evolved into something larger, or if Jeff and Amanda knew that it was going to take this many bricks when they started? With all that space to fill, they of course had to get some dirt delivered. I'm known around my neighborhood for getting a huge pile (6 yards) of Sweet Peet mulch delivered every spring, but the size of this pile of dirt is kind of daunting even to me. They even finished off the garden bed with one last row of bricks on the top. Doesn't that look nice? I love that this looks like it should be a massive landscaping bed in a fancy park, and yet it's going to hold fruits and veggies... veggies are beautiful enough and deserving enough of such a lovely home, after all. So what's going into the garden? I have yet to see the full list, but I know that some of the neighbor girls helped Amanda plant seeds the other day--and as a result, she's way ahead of schedule! See, Amanda is a big softie (that's part of what I love about her) and when the girls seemed disappointed that they were "already done," she went in and found more seeds for them to work on. Generation Y exposing today's kids to gardening.... that makes me very happy! No word yet on whether the extra seeds will require a matching garden in the other corner of the backyard. If so, I'm guessing it won't be built until next spring--it will probably take that long for their aching backs to recover from all of this hard labor. 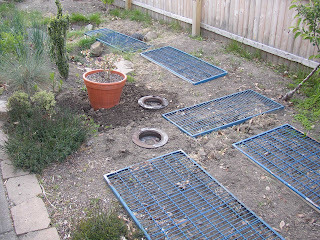 As you can see, even Miss Molly, their usually indefatigable Golden Retriever, was pooped after this huge project.